Let me preface this by saying that I don't usually read books like this; however, I was away on vacation in Cuba and I got to thinking about reading 'beach books'. Usually, I think of books by Dan Brown or Michael Connelly or Jodi Piccoult or the like... the mass market paperbacks that don't interest me in the slightest. I'm not intending to mock books like these or those that read them - I am a strong believer on 'to each, his/her own.' That said, I just have no interest and after I finished "A Journey to the Centre of the Earth", I decided to focus on some light reading that I probably wouldn't read at home. I received "Living the Good Life" due to joining a gym here in Canada. I figured I would never read this book, but I brought it to Cuba with the full intent of giving it away after I finished it. Because there were a few appendices that I thought I may eventually use for fitness goals, I ended up keeping it... and of course, I needed to do a review on it! So here it goes. 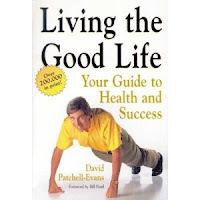 The book details the life story of Patchell-Evans ('Patch') and why he started 'Good Life Fitness.' There are a bunch of details on why he started his company, what happened to him health-wise and how he was able to turn it around including a severe case of arthritis and a horrific motorcycle accident. Also included in the book are testimonials of 'normal people' which are supposed to get us motivated. These honestly had very little effect on me as I read the book, but I'm sure others are happy to hear about how others turned their lives around. In the end, it's supposed to give the reader a perspective that everyone wants to be healthy for different reasons and possibly one of those reasons (or more) you can identify with. What I ended up taking from the book are some concepts about weight training, fad diets, muscle building and cardio workouts. Specifically, if you are on a fad diet... your body burns muscle before it burns fat... so starving yourself will reduce your weight, but it reduce your strength (due to loss of muscle) as well. Since muscle burns more calories than fat, eventually you GAIN weight because you have less to burn what you eat (and yes, you have to eat). Let's say that you workout for 6 months, three days a week... if you stopped working out, it would take much less time to reverse what you have already accomplished... pretty much six months again to go back to where you started from. However, if you don't do cardio for a week you lose something like 30% of your stamina. I'm paraphrasing here, but you get the gist. Muscle is harder to lose if you miss time in the gym for stretches of time. I just started working out consistently, and I have a long way to go with my personal goals. I currently do thirty minutes of cardio approximately three days a week as well as three 1 hour weight training sessions a week, and since since September, I have felt great. I have lost 15 pounds and started to notice my body getting more toned. For me, I feel like I have more energy and I like that parts of my body are becoming less flabby - and I guess that's a good start. The other point that I have often thought about during my weightlifting is, when can I stop focusing on getting 'better' and be happy with who I am and my fitness level. There is a colleague at the company I work for who is a pretty big guy, and I asked him why he wasn't increasing his weights and he simply said 'I don't need to get bigger. I just go to the gym to sustain what I have.' That is his secret to staying fit, healthy and happy. He's not going to kill himself trying to always get better. The last lesson of 'good enough is good enough' is something I need to focus on as an end goal, even if it is far off. It helps me realize that while working out has to be part of my life indefinitely, there is a point in time where I can feel like I am not playing catch up with my body. This came up at last night's meeting! I have this book on my shelf from when I signed up at Goodlife four years ago. Because of you, I've now put this book in my queue. PS: I'm a workout freak. If you need tips, I can help. I'm in the gym 5-7 days a week. Although I might need to, this isn't really the type of book I would pick up ~ but it sounds interesting enough to take a chance. I hope you have a chance to visit one of my blogs: LibrarysCatBooks and Never Forget: Holocaust Resources ! !